everything distils into reading: The Sunday Post/Sunday Salon: Reading is back and how!! 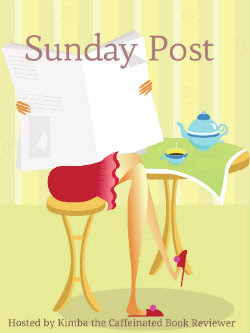 The Sunday Post/Sunday Salon: Reading is back and how!! I am writing a Sunday Salon post after a long time. To be frank, there was nothing to write. I was undergoing a massive reading slump. It lasted more than a year. I could read only 14 books from January to May. And half of those are kinda trash. However, things are starting to change. I read 11 books in the past one week. Assorted. These include mystery, crime fiction, poetry, historical and of course, romance. I have not done that for a long time now! 11 books is a pretty good figure by any standard. One reason for this is, my telephone line was down which translates into NO net for five days! As I don't watch much TV, the only alternative was reading! I picked random books and finished those in one go. And yes, I feel good. I am still in the midst of two books, and plan to finish one today. Hope this lasts and only then I can reach 50 books in 2012. I know that is NOT good enough but the way I was reading, it is NOT bad either. I have not taken part in any challenges. And if you have any suggestions, I am open to that. Reading isn't a contest so no matter how many books you read, it's good. I'm glad your slump has ended. Oh, I agree with Kathy...it's just important to read...and to enjoy! Glad you are doing that again. 11 books in a week? Wow, that's definitely "back"! Hope you manage to stay on top. I also wanted to say that I really like the layout of your blog. And finally, regarding the Franz Kafka quote at the top of your page, does anyone know if there's a list of his favorite books anywhere. I'd like to know what books wounded and stabbed him. It doesn't matter how many books you read or how long it takes you.. Read what make you happy. See, being disconnected from the internet ended up being a good thing look at how much reading you got done. I hope you continue to find some good books. I was in a reading slump for a couple of years. I hated it but I am finally over it and enjoying reading the books I missed out on! I've been in an out of a reading slump for the past 6 months so I totally understand. 11 books in a week is pretty impressive. Awww happy you have emerged from your reading slump! I've talked to so many bloggers who have had slumps. Glad to see you are back and great to meet you! I'm glad to hear you're out of your slump! We all have months like that. 11 books in one week is absolutely insane by any standard! I'm so glad your slump has ended and with a big bang! 11 books in a week is awesome. I love reading frenzies like that!